Q: What goes black, white, black, white, black, white? A: A panda rolling down a hill. Q: Why do pandas have fur coats? A: Because they&apos;d look stupid in denim jackets. A: Because they&apos;re in black and white. Q: What do chinese bears eat for breakfast? Q: What&apos;s a Chinese bear&apos;s favorite expendable organ? Q: Did you hear about the party at the Chinese zoo? Q: What do Chinese bears wear around their face when they&apos;re robbing banks? Q: How did the panda lose his dinner? Q: Why did the panda date a Victoria Secret model? A: She had really big bamboobs. Q: What did the panda say when he was forced out of his natural habitat? Q: What&apos;s black and white and as hard as a rock? A: A panda that&apos;s fallen in cement. Q: What&apos;s black and white and goes round and round? A: A panda stuck in a revolving door. Q: Did you hear about the Pandas that were in a food fight? Q: What goes white black white black white black red? A: A panda that falls from a cliff. Q: How many Pandas does it take to change a lightbulb? 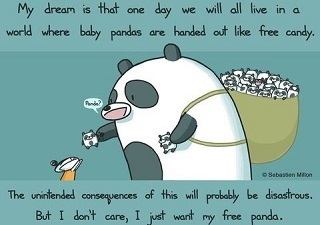 A: The Pandas will get back to you on that, as soon as they can find a store that sells clothing in lightbulb sizes. Q: What&apos;s black, white and very noisy? Q: What&apos;s black and white and yellow? Q: What&apos;s black and white, got four legs and a trunk? Q: What&apos;s black and white and stands in the corner? Q: What&apos;s black and white and goes up and down? Q: What&apos;s black and white, has eight wheels and travels very fast? Q: What&apos;s black and white and bounces? Q: What goes black and white, black-and-white and downwards? Q: What goes black and white ha-ha? Q: What&apos;s black and white with red spots? Q: What color socks do bears wear? A: They don&apos;t wear socks, they have bear feet! Q: What to polar bears eat for lunch? Q: What do you call a grizzly bear caught in the rain? Q: What&apos;s black and white, black and white, and black and white? A: A panda bear rolling down a hill! A: A panda bear with a sunburn! Q: Why do bears have fur coats? A: Because they look silly wearing jackets! Q: What do you get if you cross a grizzly bear and a harp? Q: Why didn&apos;t the teddy bear eat his lunch? Q: What do you get if you cross a teddy bear with a pig? Q: What&apos;s white, furry, and shaped like a tooth? Q: How do teddy bears keep their den cool in summer? A: They use bear conditioning! Q: What do teddy bears do when it rains? Whomever it was panda bear jokes, first, we’re sure glad he did. 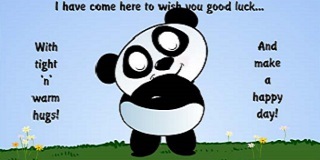 Here are our favorite "funny panda jokes". Feel free to add yours to the list in the “Comments” section!